The moment Kristen Turman learned her 20-year-old son had been shot, she left the detectives in her living room. She ran to her bedroom, fell to the floor and vomited. She rushed to Anthony’s bedside at Harbor-UCLA Medical Center in the early morning hours of June 17. He wasn’t responsive. Doctors told her that Anthony Iniguez was brain dead, but she hoped for a “miracle.” A nurse played her son’s favorite music — oldies from the 1960s — in his ear. A doctor cried with Turman. But the miracle never came. Three days after Iniguez was shot while riding his bike home from a friend's house, he was taken off life support. As police continue to investigate the killing, Iniguez’s family is struggling with life without him. Iniguez’s oldest son, David, 2, pads around his grandmother’s house, carrying his father’s photograph and crying for him at night. His 7-month-old son, Oziah, is too young to understand. The children’s mother says she misses her “best friend,” but she’s trying to be strong for the kids. Not a day has passed where his grandmother hasn’t shed tears. Police say Iniguez was not a gang member. When he was shot June 17 near 252nd Street and Normandie Avenue, he was riding his bike home from a friend’s house in an area that is home to several gangs, LAPD Det. Scott Coffee said. Iniguez met his wife, Vanessa Guzman, through mutual friends at Narbonne High School, where Iniguez played football and later dropped out. The two attended an intense military-style academy together, where Iniguez excelled, said Staff Sgt. Houa Vue, with the Sunburst Youth Academy in Los Alamitos. “He always met the standards or exceeded them,” she said. Throughout the program, Iniguez was always willing to help others, Vue said. She remembered Iniguez as quiet, but family oriented. All of the students in his class graduated the 18-month program, which is rare, Vue said. Guzman said that Iniguez became more self-motivated throughout the program, and when he found out she was pregnant, he immediately got a job. He had goals of finishing high school. Iniguez was present for the birth of both of his children, and if his children were sick, he’d leave work to be with them. “He didn’t really care what he worked in as long as he was providing for the kids,” Guzman said. He dreamed of coaching his sons in sports and wanted to be the father he never had, his family said. He enjoyed family movie night and trips to the beach, they said, and would rather be at home with his children than out with friends. Recently, his mother got a tattoo on her chest with her son’s name, and an image showing the last movements of his heart monitor. Anyone with information can call Coffee at (310) 726-7887. Those who wish to remain anonymous can call Crime Stoppers at (800) 222-8477. 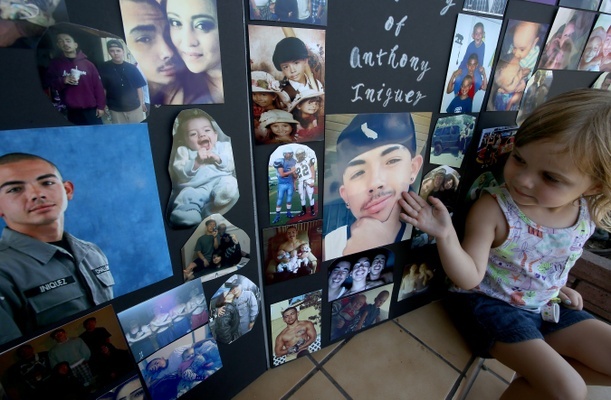 Photo, above: Jade Bryant, 3, looks at pictures of her brother Anthony Iniguez, who was killed in June while riding a bicycle home. Photo, right: After Anthony Iniguez was killed, his mother got a tattoo with her son's name and the last movements of his heart monitor.